* I visited the Imperial War Museum in London this week. Newly reopened after a £40m facelift - it is a spectacular experience, right from the moment you walk in and see - hanging from the ceiling - a WWII Spitfire fighter plane and a Nazi V2 Rocket - the direct forerunner of the rocket that sent man to the moon (both designed by Nazi scientist and slave labour enthusiast Wernher Von Braun). At the start of May, 1916, as Dublin city centre was a smoking ruin and the survivors of the Easter Rising were being put in jail or rounded up for internment, soldiers from the 3rd Battalion, Royal Irish Rifles went to a house in the suburb of Rathmines. They had been detailed to search the home of Constance Markievicz, the British-born woman who had commanded Republic Forces during fierce fighting in St Stephen's Green. A radical socialist, Irish nationalist and suffragette, two years later, Countess Markievicz (she had married a Polish Count) would be the first woman elected to the British Parliament. On this day, however, she was imprisoned in Kilmainham Gaol. On May 6th, her sister Eva Gore-Both and her friend Esther Roper went to her empty home at Surrey House in Rathmines. When they arrived, they found that it had been occupied and ransacked by soliders from the Royal Irish Rifles, under the command of a Lieutenant-Colonel W.E.C McCammond. The countess had taken part in fierce fighting in St Stephen's Green, at one stage shooting at, and wounding, a British Army sniper. Amongst the items taken by the soldiers was a Green & Gold Banner of the Republican youth movement the countess had formed in 1909, Na Fianna. 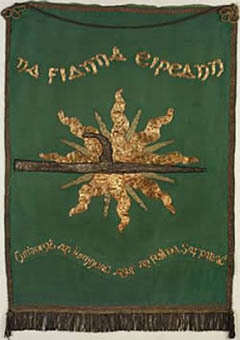 The banner had the motif of a pike (symbol of Irish uprisings since the 1700s) on a sunburst, backed by a field of Emerald Green. The slogan was (in the Irish language) : “Glaine ár gcroí, Neart ár ngéag, Agus beart de réir ár mbriathar”. Which translates (loosely) as "The purity of our hearts, The strength of our limbs, Our commitment to our vow". That banner is now hanging in a corner of the Imperial War Museum's new World War I gallery(which is mightily impressive, by the way). And if you read the little plaque next to the banner, at the end it informs you; "Lent By Her Majesty The Queen". It's a strange thought, that this relic of a terrible, turbulent time in Irish history, found its way into the hands of the British military and then into the private collection of the Royal Family, now headed by Queen Elizabeth II. I doubt the queen has it hanging in Buck House. Although you never know. There is a campaign to have the banner returned to Ireland, possibly to Sligo, which claims links to the Countess. That is something to be decided further down the line. For now, I'm glad it is hanging there in the Imperial War Museum, a small but very potent reminder of the time when, as 200,000 Irishmen served in the Allied Forces fighting in Europe and in Turkey and the Middle East, thousands of their fellow countrymen were involved in a different fight at home. Hi, thanks for reading and for commenting - I personally am happier to see the banner as part of the great Imperial War Museum exhibition, it's a v small but important reminder of the conflicting politics of the times.